Memperhatikan banyaknya pengembangan dan pembangunan data center belakangan ini, memang hal tersebut mengembirakan, karena semakin banyak unit PAC, Raised Floor, Cable Tray, UPS, Rak, Fire System, EMS dan Server terjual dan terpasang. Tapi di lain pihak, juga tingginya kebutuhan energi (baca: listrik) untuk mendukung semua ini berjalan. Penghematan dalam pengembangan dan pembangunan data center akan menjadi fokus utama kami di tahun depan. penggunaan Green IT dengan mengurangi keseluruhan energi, khususnya di lingkungan data center untuk instansi pemerintah. merubah biaya investasi perangkat hardware menjadi perangkat atau solusi yang lebih efisien. Tahap pertama yang dapat dilakukan terkait dengan aset IT. Paling mudah bagi pemerintah untuk menambah dan membeli aset IT baru, dibandingkan dengan mengelola dan memelihara aset yang ada. Oleh karena itu, isu utilisasi aset IT yang ada harus dilakukan dengan maksimal. Kami telah lama memberikan solusi manajemen aset IT, baik dengan produk AssetExplorer (http://www.manageengine.com/products/asset-explorer/) atau menggunakan ServiceDeskPlus (http://www.manageengine.com/help-desk-software.html) dimana di dalamnya terdapat modul manajemen aset, hingga DesktopCentral (http://www.manageengine.com/desktop-management-solution.html) yang melakukan fungsi manajemen desktop. Berikutnya yang menarik juga perkembangan implementasi virtualisasi di lingkungan pemerintahan, khususnya menggunakan produk VmWare. Usaha ini harus didukung dengan baik, karena membantu memaksimalkan dan meng-utilisasi perangkat server yang ada. virtualisasi server dengan meningkatkan jumlah virtual server per host. menerapkan kontrol atas aset IT , sehingga efisiensi penggunaan server fisik, komputer, laptop dapat lebih optimal. WebNMS, a division of Zoho, launched the ATM Site Manager solution based on the machine-2-machine technology (M2M), on Wednesday. Using the automated hardware and software combination, ATM operators would be able to bring down revenue loss and also improve profitability. M2M refers to technologies in which machines would be connected through the internet and would actively communicate with each other, transmitting vital data to a central location. In an ATM set up, WebNMS’ remote terminal unit (a box roughly the size of a brick) captures 12 data points including temperature, humidity, door opening/closing, lighting control and energy consumption by connecting to various sensors. The captured data is sent to a central server on a real-time basis for timely action. “ATMs are generally maintained by private operators who own about thousands of sites across the country. Most of them do not have control over ATM sites and operational costs are high,” said Prabhu Ramachandran, director of WebNMS. According to analyst firm Berg Insight, the global number of wireless M2M connections is forecasted to grow at a compound annual growth rate (CAGR) of 27.2 per cent to reach $359.3 million in 2016. The Indian market is still nascent but expected to reach $98.38 million by 2016 with a CAGR of 33.81 per cent from 2011-2016 (according to 6Wresearch). “The drastic rise in ATM transaction costs which covers property, telecom, security, power management and cash management results in lower operational savings and pressurised profitability. WebNMS’ M2M product provides reliable and value-added solutions to take control of assets over the air (SIM/satellite connection) and to get the most out of communications between machines. The WebNMS ATM Site Manager will reduce the operating cost of ATMs, increase profitability and is aimed at monitoring and controlling passive infrastructure lying across thousands of ATMs and at operating large network of devices,” Ramachandran added. The system costs about Rs 30,000 per ATM room. WebNMS is in talks with at least three ATM operators in the country for deployments. The company is running trials, Ramachandran said, but refused to name the operators. Data centers represent the nerve center of IT enterprises. With the presence of a complex mix of databases, network devices, applications and physical and virtual systems, the modern day data center present a unique challenge for IT operations. With cyber-crime looming large, data center operations are required to not only be robust and efficient, but also highly secure to ensure business continuity and data integrity. Though the IT infrastructure in data centers face both external and internal security threats, of late, internal threats seem to be far more alarming as many of the reported security incidents have been caused by malicious insiders. Disgruntled staff, greedy techies, tech-savvy contractors and sacked employees could act with malicious intent and misuse privileged access. Incidentally, the privileged accounts that grant virtually unlimited access and full controls to the physical and virtual IT resources are all pervasive in the data centers. As uncontrolled administrative access is a potential security threat, properly managing the privileged accounts and monitoring the privileged actions is imperative. Consolidating, securing, controlling, managing and monitoring privileged accounts and access have become integral aspects of Data center Infrastructure Management (DCIM). Keeping an eye on the actions carried out by the users during privileged sessions on critical IT resources is absolutely essential both as protective and detective security controls against cyber-attacks. In a single, unified solution, Password Manager Pro delivers both privileged identity management and session management. It helps enterprises consolidate all the privileged accounts and centrally control them in fully automated fashion, thereby putting an end to the convoluted manual password management practices. Password Manager Pro helps establish access controls across data centers taking care of the access management requirements of DCIM. 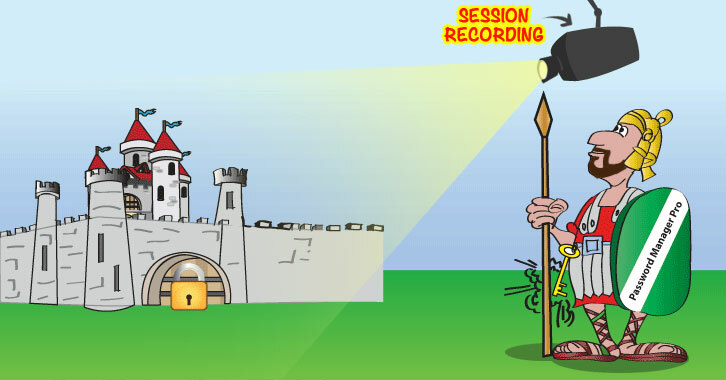 Privileged sessions launched from Password Manager Pro can be completely video recorded, archived and played back to support forensic audits. By monitoring all actions performed by privileged accounts during privileged sessions, enterprises can gain complete visibility and counter threats to information security that arise from outside as well as inside the corporate firewall. In addition, compliance regulations such as PCI-DSS, SOX, HIPAA and others mandate proper internal controls to be in place and privileged sessions be fully monitored with a view to protect sensitive data from internal abuse. With selective sharing, role-based access controls, approval workflows, policy enforcing mechanism, real-time alerts, audit trails and first-in-class remote login and session recording capabilities, Password Manager Pro helps enterprises answer the ‘who’, ‘what’ and ‘when’ of privileged access. Try Password Manager Pro now!